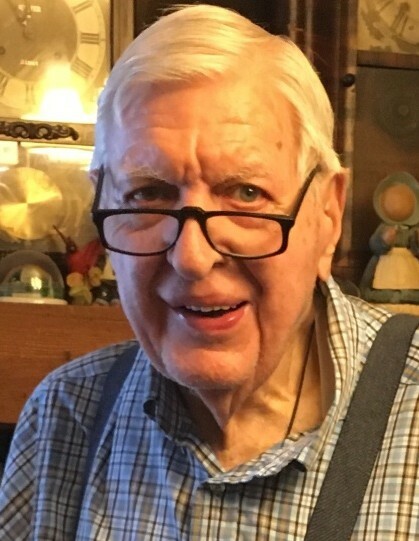 Mr. Donald Ray Hemmings, 87, of Mt. Airy passed away at the Joan and Howard Woltz Hospice Home Saturday, April 13, 2019. He was born in Surry County, April 23, 1931 to the late James Ray and Vannie Short Hemmings. Mr. Hemmings bravely served in Germany as a medic for the U.S. Army during the Korean War. He was a dedicated member of Flat Rock Baptist Church where he served as a deacon for 35 years and taught the adult Sunday school class. He was a charter member of the Flat Rock Fire Department and Ruritan Club. Mr. Hemmings owned and operated Hemmings Superette for 67 years. He was known to deliver groceries to people who were unable to come to the store, and many times offered credit to ensure people had food to eat. He is survived by his wife of 45 years, Mary “Lou” Gates Hemmings; a daughter and son-in-law, Karen and David Smith; sons and daughters-in-law, Jeff and Merry Thomas, and Mark and Debbie Thomas; grandchildren and spouses, Devin and Heather Thomas, Chad and Leigh Ann Smith, Tracy and Brian Snow, Justin Smith, Timothy Thomas and Amanda and Eric Barnett; five great-grandchildren and one on the way; a sister and brother-in-law, Sue Hemmings Young and Kenneth Young; brothers and sisters-in-law, John D. and Betsy Hemmings, Douglas Franklin and Sylvia Hemmings, Jerry Dean and Marnie Hemmings; an aunt, Flora Hemmings White; and several nieces and nephews and a host of friends. In addition to his parents, Mr. Hemmings was preceded in death by sisters, Faye Barker and Margaret Stone; and brothers, Jimmy Gray Hemmings and Charles Allen Hemmings. Funeral services will be held at 3:00 PM Monday at Flat Rock Baptist Church with Dr. Jon Cawley, Rev. Rusty Reed and Rev. Ken Young officiating. The family will receive friends immediately following the service at the church on Monday. A private entombment will be at the Midkiff Family Cemetery. In lieu of flowers, the family had requested that memorial contributions be made to Flat Rock Baptist Church, P.O. 587, Mt. Airy, NC 27030 or the Joan and Howard Woltz Hospice Home, 945 Zephyr Rd., Dobson, NC 27017. Online condolences may be made at www.moodyfuneralservices.com.